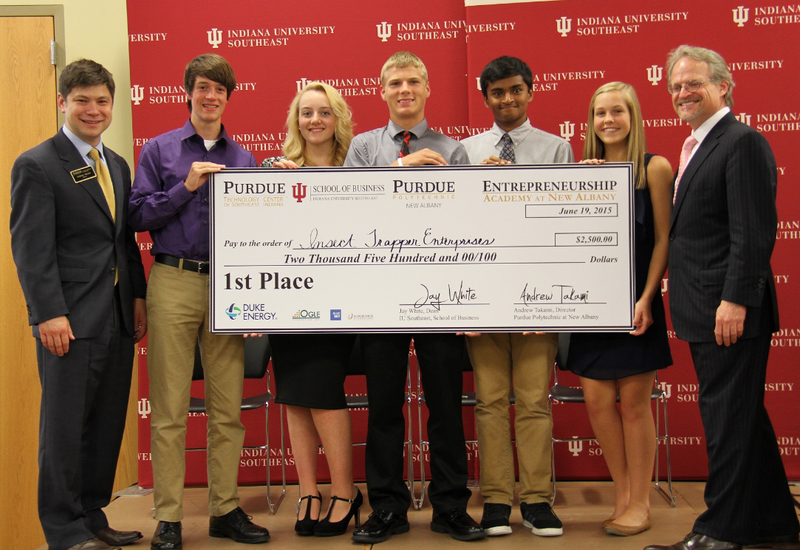 The winning team, “Insect Trapper Enterprises,” with School of Business Dean Jay White and Purdue College of Technology at New Albany Director Andrew Takami. NEW ALBANY, Ind. – Indiana University Southeast provided a unique opportunity for 23 exceptional high school juniors and seniors in the Southern Indiana and Greater Louisville areas to build their business acumen last week. The Entrepreneurship Academy at New Albany is a collaborative effort between IU Southeast School of Business, Purdue Polytechnic Institute and Purdue Research Park of Southeast Indiana. The week-long program introduced students to entrepreneurship and provided mentors from local business leaders and field experts. The participating students were broken into five teams and tested the viability of a business idea, identified capital needs to start a company and devised a go-to-market strategy. At the conclusion of the academy, teams gave an investor presentation to a panel of judges, “Shark Tank” style. Members of the winning team (pictured above) received a $2,500 tuition check, that can be used at IU Southeast and Purdue University campuses. Partners for the 2015 Entrepreneurship Academy at New Albany include: Duke Energy, Ogle Foundation, Inc., Blue Sky, Horseshoe Foundation of Southern Indiana, Terri Lynn’s Catering By Design, Inc., and Velocity Indiana. 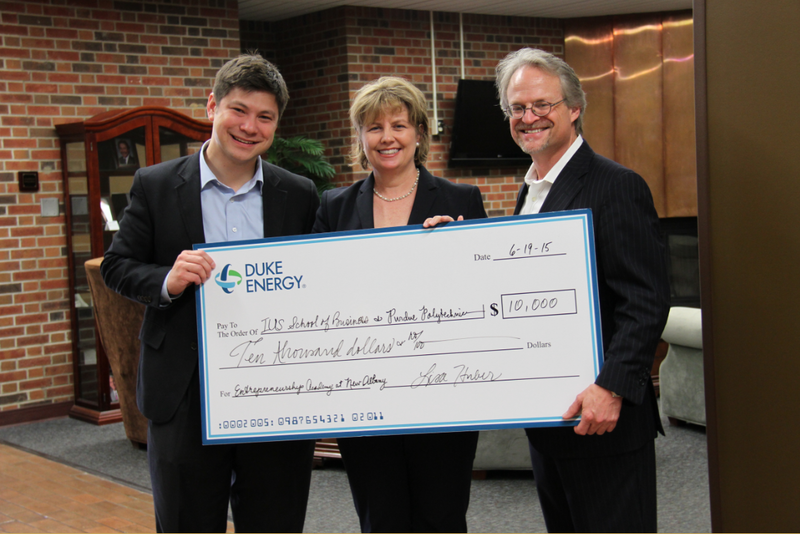 Lisa Brones Huber of Duke Energy presents check to IU Southeast School of Business Dean Jay White and Purdue College of Technology at New Albany Director Andrew Takami for the Entrepreneurship Academy at New Albany.